Virunga National Park is Closed. Time to Slow Down. The development inevitably slows down our integration of the Democratic Republic of Congo into the Gorilla Highlands region. Even though Kahuzi-Biega National Park with its rare Grauer’s gorillas (pictured above) remains open for tourism, we cannot include only a tiny section of eastern Congo in our publications. Therefore the pages showcasing Congo’s amazing attractions won’t yet feature in the Gorilla Highlands Pocket Guide, the Interactive eBook or on the website this year. But that doesn’t mean we are giving up on Congo! We are continuing our online coverage of the DRC and our brand-new newsletter will be available in French. 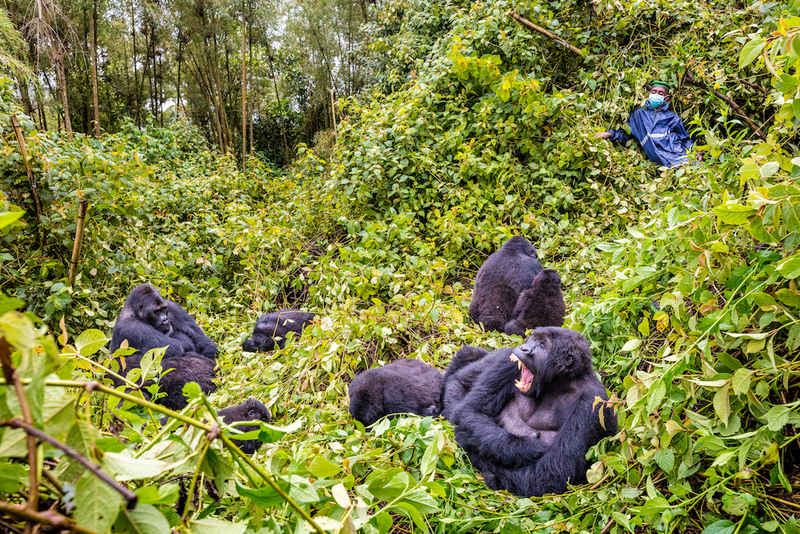 Congolese participants will of course be invited again to the Gorilla Highlands Bootcamp. Above all, we hope to get a delegation from Kahuzi-Biega to the Batwa Jamboree. Let’s all keep our Congolese friends in our thoughts. It won’t be easy for them this year, but hopefully 2019 will treat them better. I am writing to you in the aftermath of the tragic incident of the 11th May, in Virunga, in which one of our rangers was killed, and three people including two visitors were abducted, and subsequently released. The safety of our visitors will always be our highest priority, and for that reason we have taken a number of important measures. We are investigating the incident and assessing all the additional measures that need to be taken to provide the strongest possible assurance that every reasonable step has been taken to keep our guests safe. To this end, we have hired an internationally respected specialist security firm to audit our security measures so that we can make a balanced and rigorous assessment of visitor security. We are also hiring additional security staff, both locally and internationally, to strengthen our team and our security protocols. However, it is abundantly clear that the Virunga region is deeply affected by insecurity and that this will remain the case for some time. For Virunga to be safely visited, much more robust measures are needed than in the past. This will require a very significant investment, and makes it impossible for us to re-open tourism this year. This has been a profoundly difficult decision for me, and carries with it enormous disappointment for all of those, including yourselves, that invested such hope in the extraordinary impact that tourism was having on people’s lives around Virunga. It also represents an enormous financial strain for the park, but we are convinced that it is the only responsible decision that we can make under the current circumstances. We are extremely sorry for the inconvenience that has been caused, but remain deeply committed to the vision of developing a world class tourism destination in Virunga. We will relaunch this extraordinary project, but from a position of much greater strength, and sincerely hope to have you alongside us on this journey. Our team, led by Julie Williams, will remain in place, and can be counted upon to address any further issues that need attention. We are deeply thankful for the patience and support that you have shown in these difficult times. ← What Powerful Simple Thing Do Indigenous People Crave?